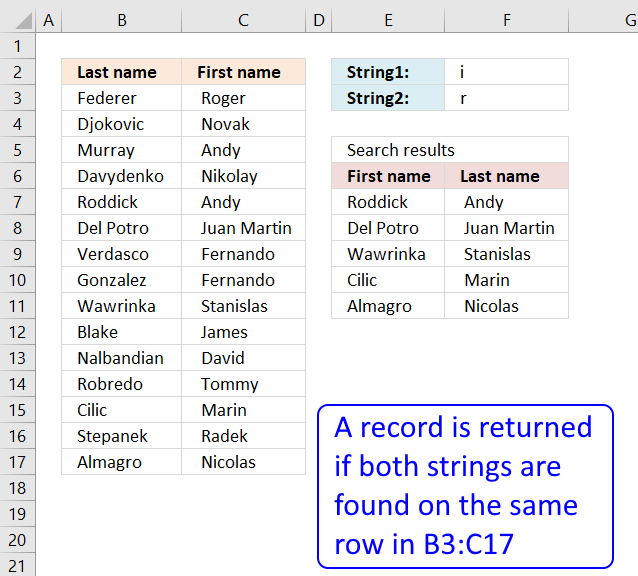 This article explains different techniques that filter rows/records that contain a given text string in any of the cell values in a record. Example, row 3 is extracted above because string AA is found in cell C3. Row 4 and 5 are also extracted because string AA is found in cell D4 and E5 respectively. How do I extract rows that contain a string in a data set or table? 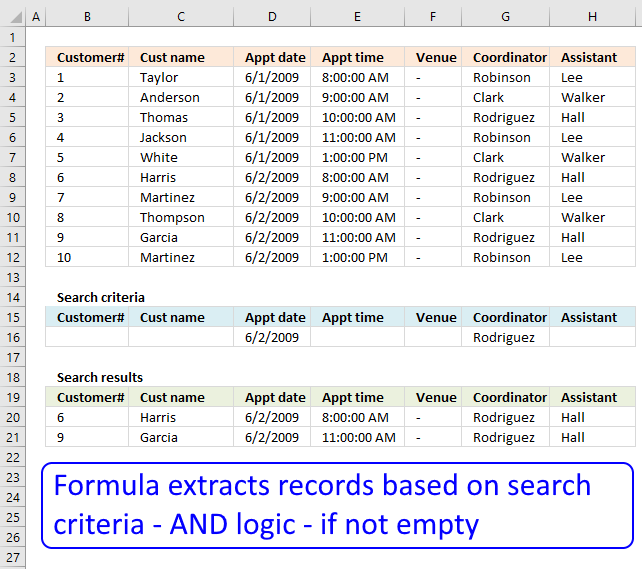 You can use a formula to extract records based on a search value, it also returns multiple records if there are any that match. 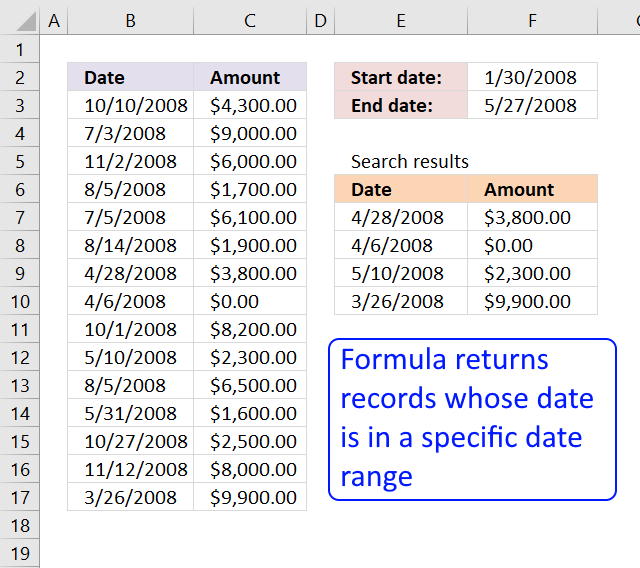 The advantage of using a formula is that it is dynamic meaning the result changes as soon as a new search value is entered. The downside with the formula is that it may become slow if you have lots of data to work with. How do I filter rows that contain a string using Advanced Filter? You also have the option to filter records using an Advanced Filter, it allows you to perform multiple search values using OR-logic across multiple columns. This article explains how to set it up, jeep in mind that it needs a small amount of manual work in order to apply new filters. How do I filter rows that contain a string using an Excel defined Table? 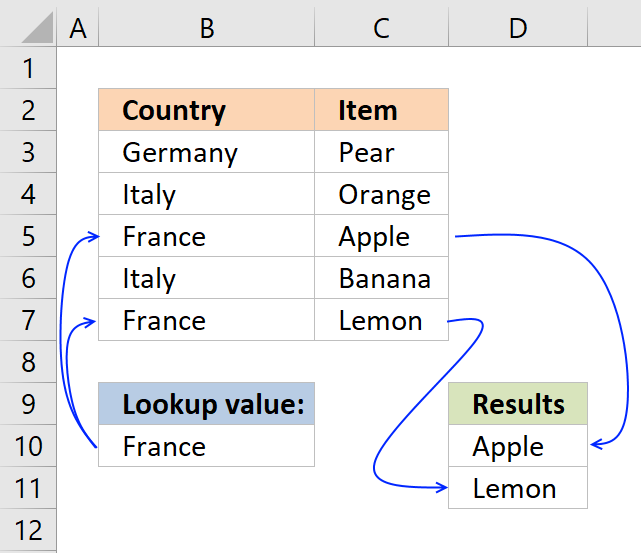 The Excel defined Table needs the COUNTIF function to accomplish the task which may slow down the calculation considerably if your data set is huge. I recommend using the Advanced Filter if speed is an issue. To enter an array formula, type the formula in cell B13 then press and hold CTRL + SHIFT simultaneously, now press Enter once. Release all keys. Copy cell B13 and paste to cell range B13:E16. 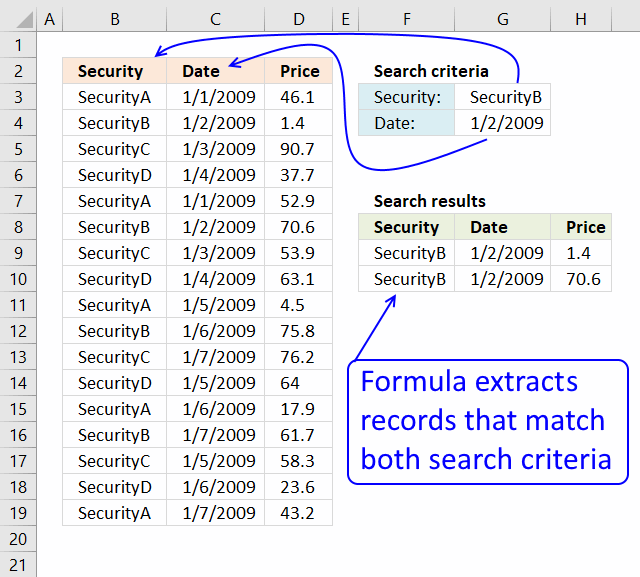 Replace FIND function with SEARCH function if you don't want the formula to perform a case sensitive search. The FIND function returns the starting point of one text string within another text string, it returns a number representing the position of the found string. If not found the function returns the #VALUE! error. The ISNUMBER function returns TRUE if the value in the array is a number and FALSE if not a number, it returns FALSE even if the value is an error value which is handy in this case. Column B has no cells containing string "AA". Column D has 1 cell containing string "AA". Cell D4. Column E has 1 cell containing string "AA". Cell E5. We need to calculate the row number for each cell in order to replace TRUE in the array with the corresponding row number. To create the array we need we use the MATCH function and the ROW function. 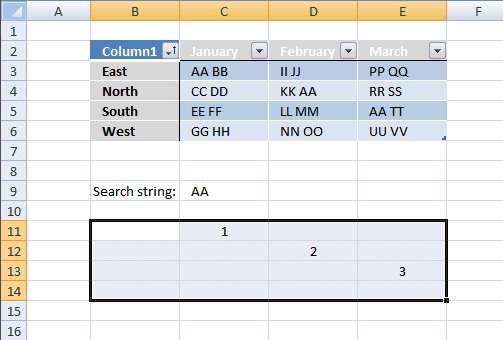 If string "AA" is found in a cell in the table the corresponding row number is returned. The ROWS function keeps track of the numbers based on an expanding cell reference. 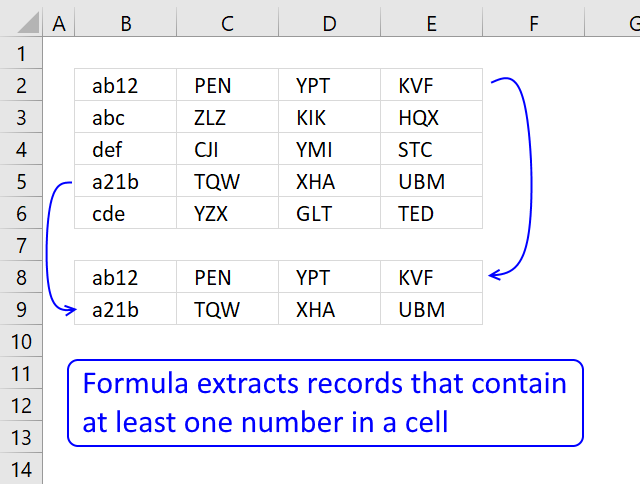 It will expand as the formula is copied to the cells below. and returns "East" in cell B13. The IFERROR function allows you to display a blank if the formula returns an error. Note, the IFERROR function handles all errors. Use with care. Select any cell within the dataset. 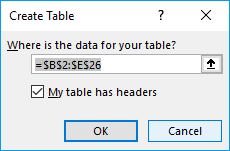 Click checkbox if your dataset contains headers for each column. 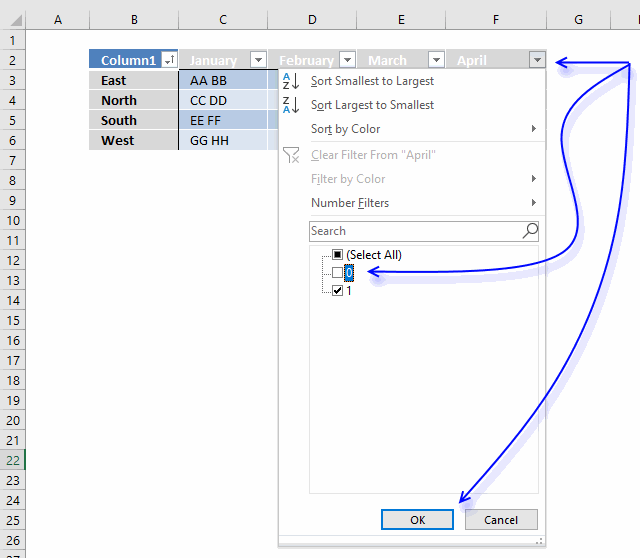 Excel fills the remaining cells in the table for you and creates a header name for your new column automatically. Table13[@[January]:[March]] is a structured reference to data in columns January to March in table Table13. 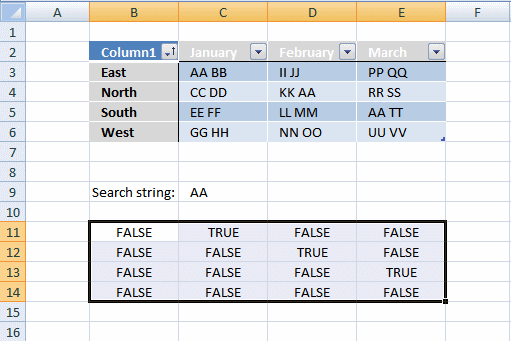 The COUNTIF function returns 0 (zero) if none of of the cells on the same row contains string AA, to do a wildcard search use the asterisk * before and after the search string. The at sign @ before the header names indicate that the reference is to values on the same row. and returns 1 in cell F3. String AA was found once in cell range C3:E3. Click black arrow next to header name "April". Click checkbox next to 0 (zero) to deselect it. April is not the correct header name, I changed it to Condition. 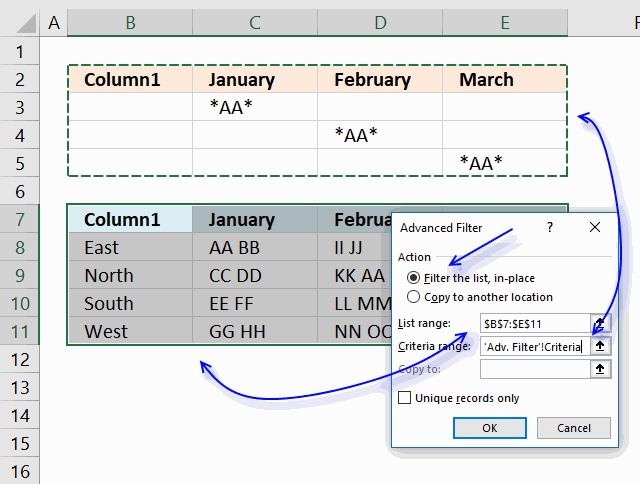 The Advanced Filter is a powerful feature in Excel that allows you to perform OR-logic between columns. The asterisk lets you do a wildcard lookup meaning that a record is filtered if the text string is found somewhere in the cell value. 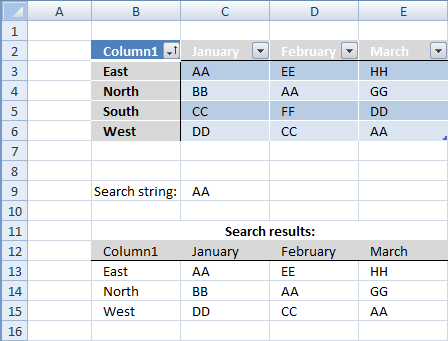 Copy column headers and paste to cells above or below the dataset. Note, if you place them next to the dataset they may become hidden when the filter is applied. Type the search condition and add an asterisk before and after the text string. 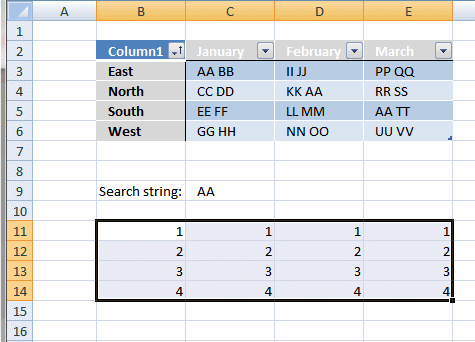 Add another search condition, make sure they are in a row each in order to perform OR-logic. Click radio button "Filter the list, in-place"
To delete the filter applied simply select a cell within the filtered dataset, then go to tab "Data" on the ribbon and click "Clear" button. 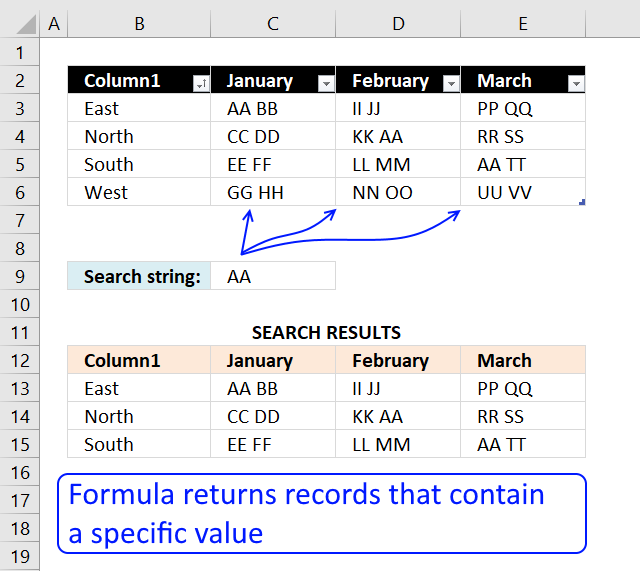 The following article shows you how to VLOOKUP and return multiple values, the lookup value must match the entire cell value. Search for a single text string in a single column and return multiple matches. 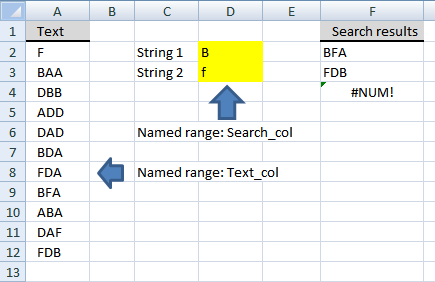 Search for a text string in a single column and return multiple corresponding values. 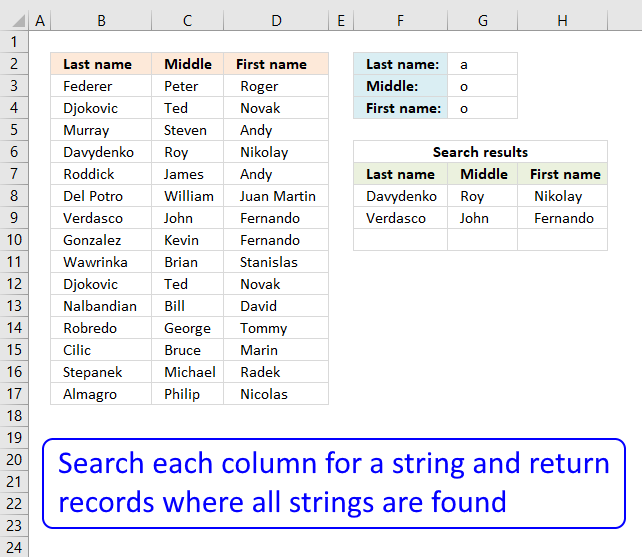 Search for multiple text strings in a single column and return multiple corresponding values. Search for a text string in multiple columns and return corresponding values. Lookup with criteria and return records. 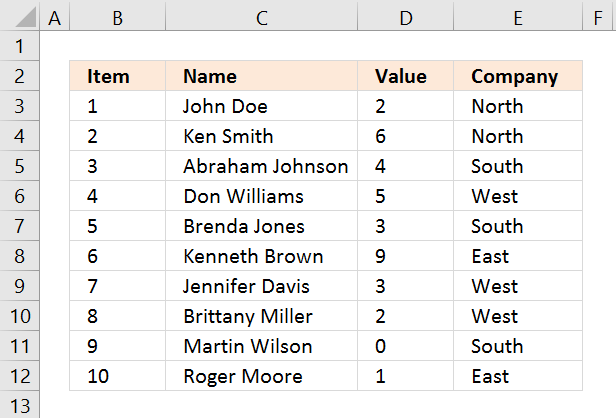 Do you know if there is a formula (or combination) that results in a text value I want to use with "vlookup"
Something like the "like" function in Access. I want to Find the part "Tech". Then with Vlookup I want to find a related account in an Table. such a Tech is related to "200 Repare account"
So I can keep controle over my Bankaccount for example. Can you describe the two tables and how they are related? Request your help for a similar kind of a query. I'm in a fix and can't really figure out how to get the required output. For e.g. Row 1 for Column A has a value 00125465.. Now in column B I have a value like (without qoutes) "With reference to the record number 00125465, we would like to..". This value of column A might exist in multiple rows of Column B. 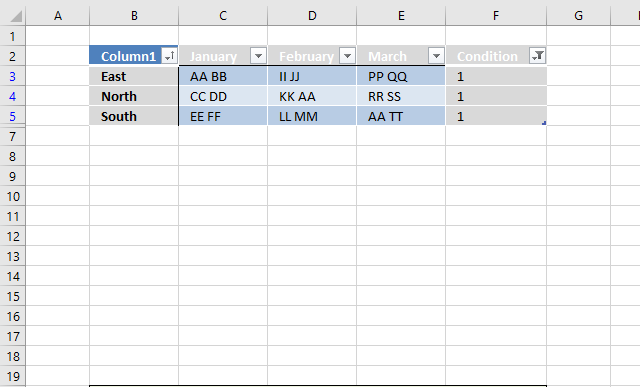 In my actual data there are around 160,000 unique values for column A and 97,000 values for column B. I need to search for all values of column A in column B and have some kind of an identifier in say Column C to know what values for column A are present in Column B. 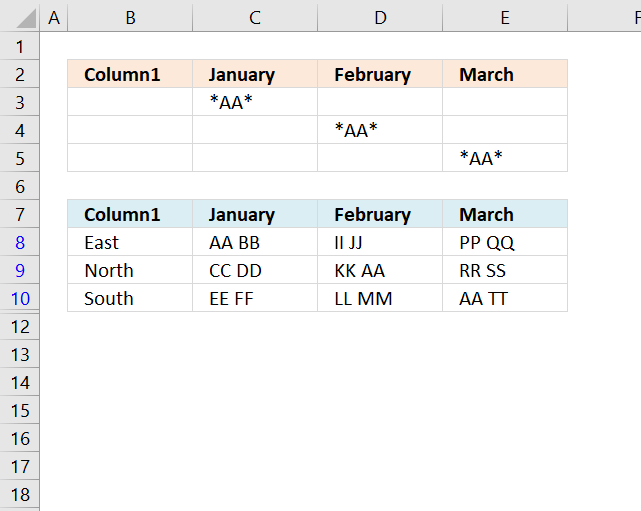 Please note that a value for Column A might exist on row # 10 and then row # 1000 in column B. Many thanks for the file. Apparently it looks to be exactly what I was looking for. This is simply great :)..
Having said that the code seems to be really complex. Can I please have your email address so that I can request for any clarifications if required for the code ? Sorry for bothering you again for this. Will you be please kind enough to define the formula in two three lines in simple words for me.. Can't really understand how these functions are working.. specially ' _xlfn.IFERROR ' :(.. Apologies for the bother but would really appreciate your help. If I do not want to use table in the formular for ranges in 2003? This formula works great for what I'm trying to achieve. I have a project data sheet capturing names of people involved. I'm using this to allow people to search for a particular name, and for all relevant projects to be displayed. 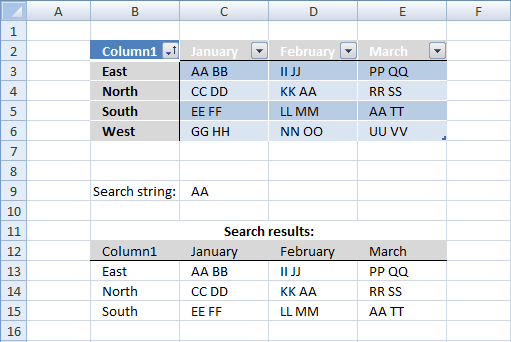 Have modified the formula to use a SEARCH function instead of FIND for the closest match, but I need to identify all the column numbers in the data matrix where there's a match for an index function against another matrix of the same size. 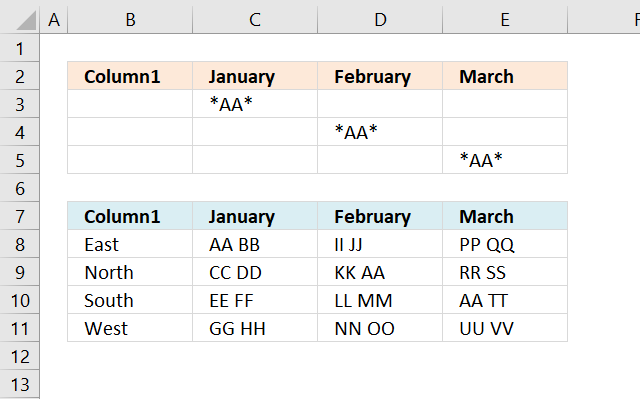 I've figured out how to retrieve the row numbers, but am stuck at getting the right columns to be displayed. but I need to identify all the column numbers in the data matrix where there's a match for an index function against another matrix of the same size. Thanks Oscar, for the prompt reply. Is it possible for me to attach or send you an example of what I'm working on? I have a datasheet on different projects, names of colleagues involved in the project are organized in 12 columns (each cell may contain more than one name. For this reason, I've modified your function to use SEARCH instead of FIND), and their involvement in the project captured in another array of 12 columns. Purpose of the spreadsheet is for any user to enter a search name (e.g. Peter) and for the spreadsheet to display all projects this person is involved in. For this, the function you've developed works beautifully. This is also why I'm using SEARCH, as the user may enter only a first name, and the function can capture the closest match from a cell that may contain 3 names. FIND can only return an exact match. Besides returning the name of the project as a result, I'm looking to develop this further by displaying the role of the person for this project. For example, Peter is involved in Project X as a Sales Manager. His name is captured in Resource_Name_Column7 and his role is captured in Role_Column7. The current function can return Project X as a result when user searches for 'Peter'. However, I do not want to index out all 12 columns that matches the Row at which his name is found. I'd like to display the role he plays in this project by indexing the x and y coordinates at which his name is found in the Names array, against the Roles array which is of the same size (both 12 columns). The above example is excellent one. But my requirement is something different. I need to print only column1 contents when the pattern AA matches. content should be repeated twice. Oscar - Thanks so much for providing this! It's really helpful. I've implemented the array formula and it works great except that if the search string occurs 2x in row of data, the row is returned twice. If it occures 3x, the row is returned three times. 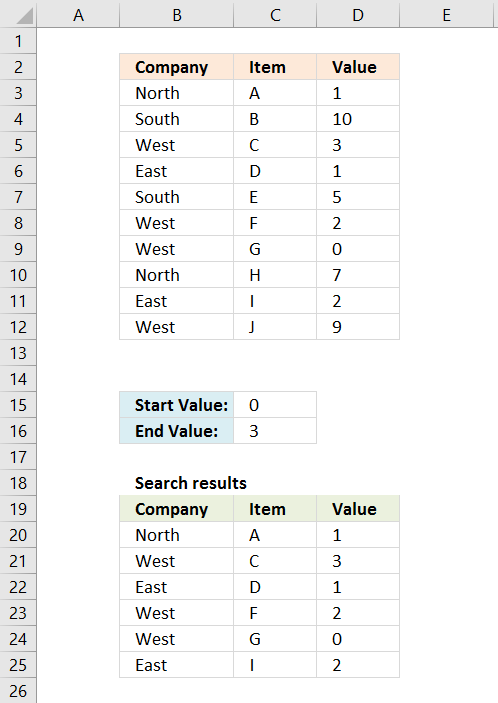 I'd like the results to show only 1 instance of each row no matter how many times the search string appears in that row. How can that be done? Thanks, Oscar. 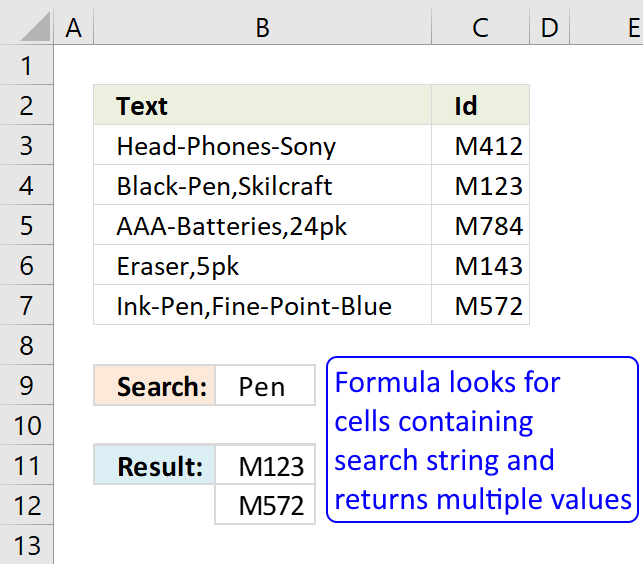 The function as is in the file was returning the same text string in all cells in the array - and not the search string. I changed the end part of the function from "...ROW(A1)),COLUMN(A1)),"")" to "...ROW(Table1)),COLUMN(Table1)),"") and it is working... mostly. I'm no longer getting duplicate rows. However, the function is failing to return some rows that include the text string. I can't quite figure out what is unique about the rows returned vs those that should be and are not (or vis-versa). What do you think the fix is? However, the function is failing to return some rows that include the text string. I can't quite figure out what is unique about the rows returned vs those that should be and are not (or vis-versa). You have entered the same array formula in all cells. Enter the formula in the first cell and then copy the cell (not the formula) to the right. Copy the entire row and paste down. The array formula contains relative cell references. They change when you copy the formula. i have a column with many rows containing select queries. Hey, I want to use one command, i searched in but i didn't found. please help if you have the solution. this is my work book, only i copied a part of the workbook. the words are with numbers. I want to find / search a word which is not with a number (the word is what ever it may be / random word). I don´t understand, can you upload a picture of our worksheet? The File Image is not uploading. I will copy and paste here. In this down side file the some cells contains both number and text, and some cells contains only the text. In this work book I want to find the text containing cells. Please help me. Oscar,!! Brilliant formula, !!! 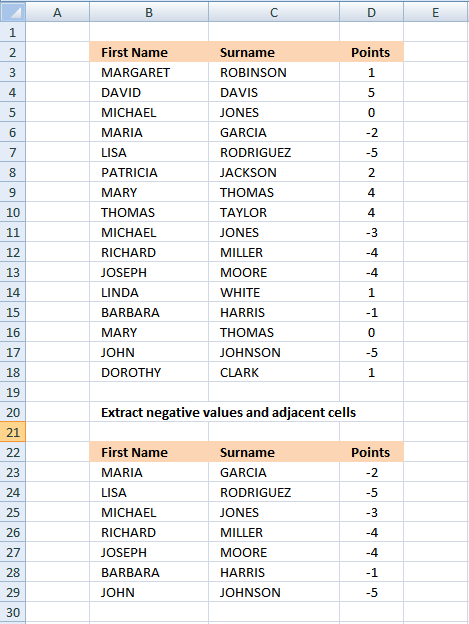 However, Id like to get any and all matching value occurances in the dataset/table. So it would return row1find,row2find,row3find etc - ideally illl like to get the row&column number of all the matches. =MATCH(G47,INDIRECT("'Sheet1'!$D$"&X47&":$M$"&X47),0) where my grid of data to look at and search is in sheet1D7:M51 and X47 is the result of your formula on the data. Ideally would like to have your result be row1|row2|....|rown depending how many matches there are (the occurances of the value-string to find its occurances). but wondered if it could be done on the grid/table as it stands based on your original formula on this page. (ive changed the delimator to || ). I cant make heads or tails of the output, further to fist 1 or 2 characters. If the delimator is , or ||, the numbers its returning are just all 1 . Williams and Johnson should have 3 and 2 after it. In anycase, you have helped me to think about this more logically, but the formula doesnt work. doent make sense given what I want it to do/identify. But we are getting somewhere...I believe. I do thank you for your help regardless. Totally. You have no obligation to. Total star. I just want to let you know that. Thank you. I believe the formula is working, 47 are the two first digits in 4743. 51 -> 5147 and so on. Are the two last digits perhaps column numbers? What does the following formula return? P.s. I can live without getting the column nunbers, I can get those myself, If i get the apperaances per row, like row x, row y, row z , and or (perhaps as I think you were doing, highlighting the number of times the object-string appears in the table), I can work out the rest myself. In anycase. Absolutely Fantastic world stopping, jaw-dropping Formula regardless !!! (just need the number of times the string appears! Not just the first time!) !!!! No, Those other 2 numbers are not the columns. South, located at row 43 column 10, returns "4339". Johnson, located at row 31, column 2 and column 3, returns "3126"
Black, located in row 7, column 9, returns "72"
Garrett, located in row 23, column 9, returns "2318"
Rogers. row 34, Column 3, retuns "4338"
Martin, row 35 column 7, returns "3530"
but the results & its application, all in one cell.. But need to adapt it to return only the row number of the occurances, and put them in the same output cell, concatonated.